Monday’s College Football Playoff National Championship Game was a homecoming for Bob Becker … sort of. 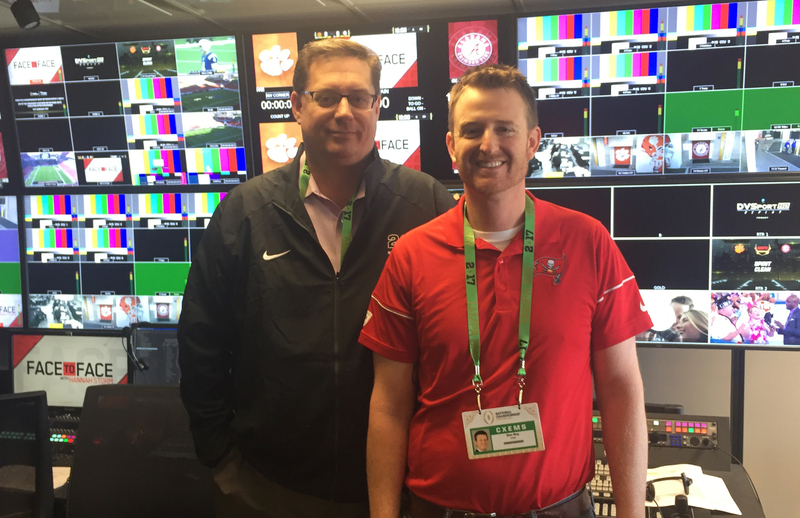 The EVP of Van Wagner Sports & Entertainment (VWSE) Productions spent five years working as part of the in-venue–video crew for the Tampa Bay Buccaneers before stepping away prior to the start of this NFL season. 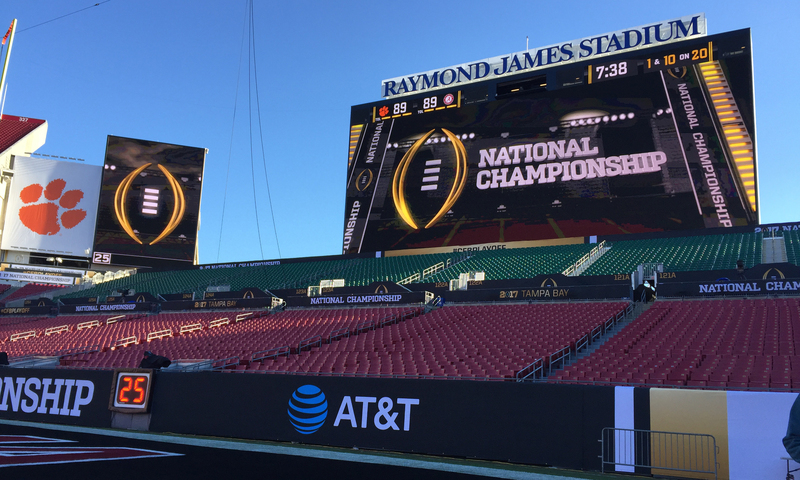 Now, with VWSE Productions, he was back at Raymond James Stadium to work the national-title game in a stadium that looks nothing like it did when he left. Before the start of the NFL season, Raymond James underwent a comprehensive video facelift, installing 14 new displays offering a canvas of more than 39,000 sq. ft. of LED space for the video team to paint on. A new control room is built around the Ross Acuity production switcher, three Evertz DreamCatcher replay servers (18 channels; six in, two out of each server), and 10 channels of Ross XPression graphics playback. Although the videoboards are not 4K (they’re 1080i), the Bucs use the DreamCatcher replay servers with 12 Ikegami HDK-95C cameras (which are 4K-capable) sprinkled throughout the stadium. Throughout the new infrastructure’s first Buccaneers season, the team’s in-venue–video crew learned a lot with how best to program a rather unique layout of videoboard space. Sure, there’s your standard big end-zone screens, which are 60 ft. high x 160 ft. wide for 9,600 sq. ft. each, but, above the corner of each end zone, there are also four unique displays shaped like towers and measuring approximately 61 ft. high x 43 ft. wide for 2,304 sq. ft. each. After some early adjustments, the Bucs video crew realized that there was potential to do something unique with those boards. It was a programming style that fans got to see in action at the championship game on Monday: triple replays. With the towers shaped more like cellphone screens than television sets, the Bucs had four game-camera operators begin shooting in portrait style, giving the TD, producer, and director in the control room four angles and formats for any given replay. As with any venue, crowd shots are also important to the Raymond James Stadium video crew. Not just for the videoboards, though. This season, the Bucs debuted an app called 15 Seconds of Fame, which essentially streams and records the feed of the main videoboards at the stadium. Within the app, users can find the moment when they may have appeared on the stadium videoboard, cut that clip, and quickly share it to the major social-media platforms. The user can also register with the app, which, using a picture and facial-recognition technology, can immediately identify when the user appears in the video and tag the moment for easy access. The in-venue–video crew also encouraged fans in the stands to shoot videos of themselves and used those videos on the tower boards to supplement any graphics presented with the intention of firing up the crowd.